On June, 27th at one in the afternoon is the moment in which my travel began. The air travel was more than twenty-four hours long from Toronto, Canada to Chennai, India (my birth place). 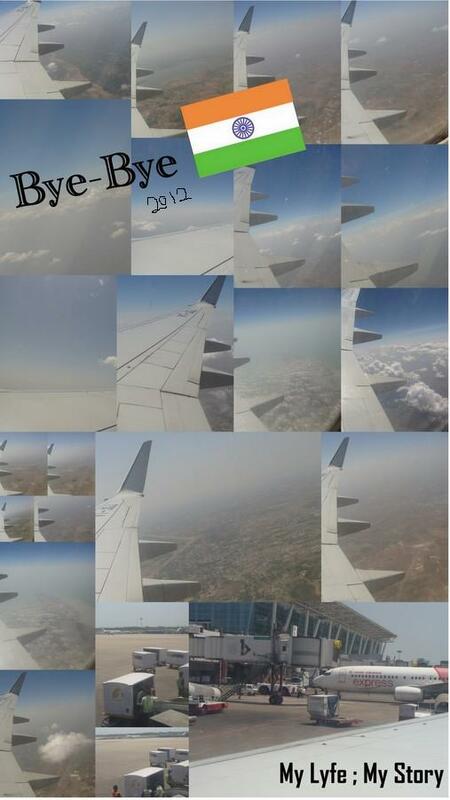 It was exhausting, but I landed there on June, 29th at one in the morning. 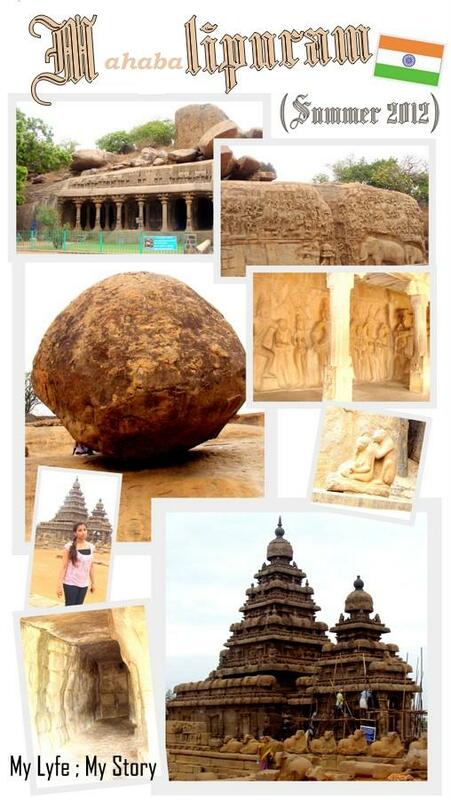 During the seven day stay in India, my dad travelled to take us to Mahabalipuram. Mahabalipuram is the “seventh century port city of the South Indian dynasty of the Pallavas around 60 km south from the city of Chennai in Tamil Nadu. The name Mamallapuram is believed to have been given after the Pallava king Narasimhavarman I, who took on the epithet Maha-malla (great wrestler), as the favourite sport of the Pallavas was wrestling” (wikipedia). To learn about the history of this historical place my dad and mom hired a tour guide, the guide literally took us to all the historical places and he didn’t miss a thing. 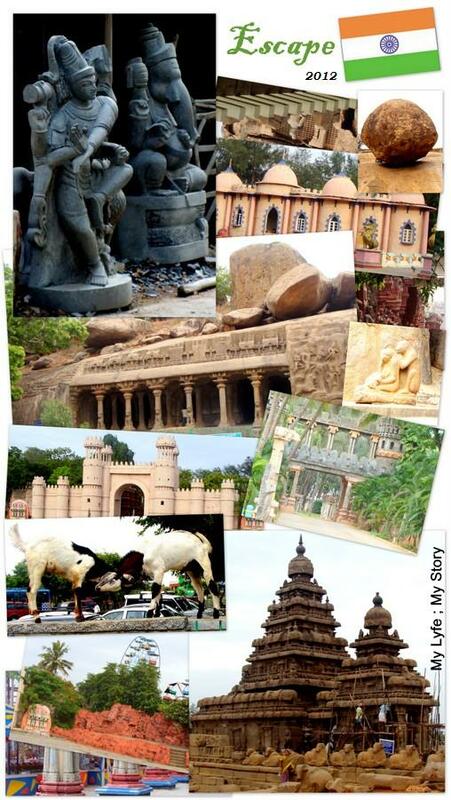 Here are the ancients structures that I saw; Thirukadalmallai (Lord Vishnu’s Temple), Descent of the Ganges, Shore Temple, Varaha Cave Temple, Pancha Rathas, Light House, elephant, monkey, snakes and many other creatures carved in granite, Tiger Cave, Krishna’s Butter Ball and etc. Also, not only did my family and I get to see the historical structures, we got to walk through those places and actually touch each of the structures. I ended up feeling so energized that I snapped about two hundred photos of the place. Only a small amount of photos are used, when I created the collage. As soon as, all the sightseeing was done, I literally ended up having an empty stomach. At that moment, my dad took us to his favourite restaurant and oh man the food was to die for, it was so mouth watering. 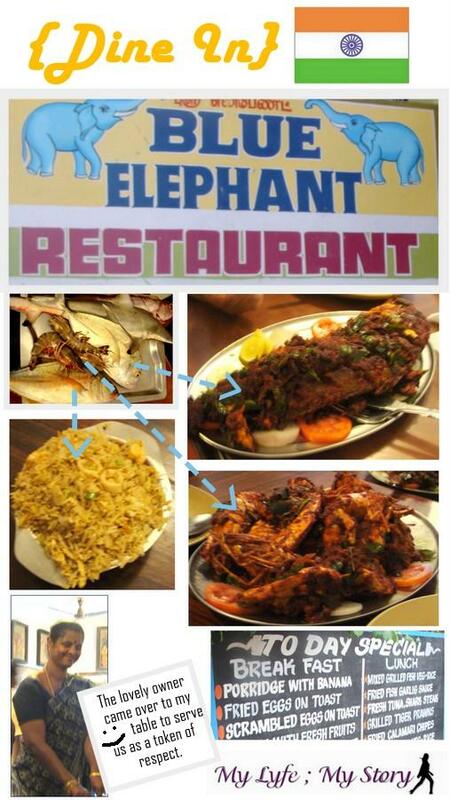 The restaurant is called “Blue Elephant Restaurant”. As soon as you walk into the restaurant you feel as if you travel so some ancient museum, as decorative items they had some unique pieces up of their wall. On the wall they had placed some extremely priceless artwork with the history behind Mahabalipuram. Also, the food serve there is fresh; when you order your food the serves bring out a huge tray filled with fresh fishes, shrimps and etc. 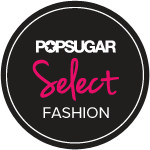 From there you can choice which pieces you want. Since, I was so hungry, all I remember is that as soon as the food was cooked and was served, I just stuffed them all straight in to my mouth without a word. The food was extremely delicious especially the huge tiger prawn; even now it makes my mouth water. Plus, the service was awesome and plus the owner of the restaurant was extremely kind enough to serve us our meal as a token of respect. Overall, the restaurant is now a memorable place will eventually go there again the future. During the road ride back from our destination, we stopped at VGP and Golden Beach. 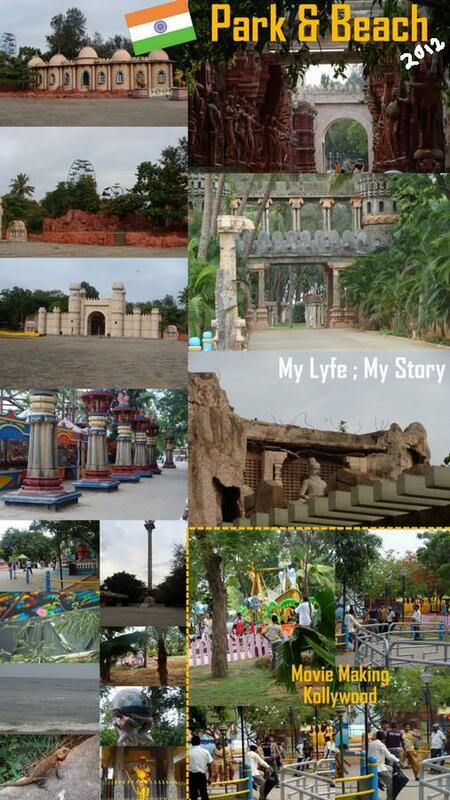 VGP Park is a famous park in India, since childhood I remember going there. This specific park hold a memorable moment that only becomes to my sister, this park was first stage my sister ever performed on and trust me at the young age of five she rocked the stage. At that time my parents said I was shy, whereas my sister just wanted to have fun. Plus, the park has changed a lot from the last time I went which was in 2010. This time, there were having a “Kollywood” shooting during our visit, it was cool to see a live film shooting. The Golden Beach have always been the same as it was in my old memories, but the weather just made me want to running to some cave. Even though, it was boiling hot we all ended up dipping our legs into the water, it felt good. Plus, my aunt and grandma enjoyed the dip in the water more than the kids did. After that one day of road trip to an amazing historical places, the rest of the days few fast and on July 5th, I ended up saying my finally goodbye to India, since I rarely know when I will be going back there again. 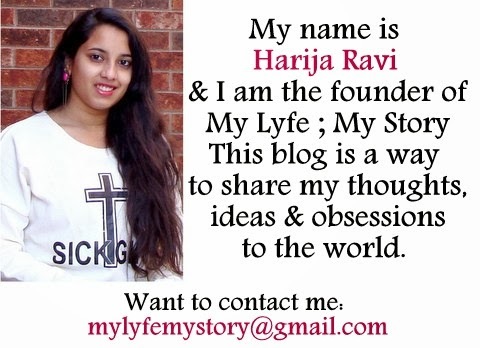 Well, this is first chapter on my travel story and don’t you worry there are many more to come. Until next time, take care and enjoy the warm weather.